The Trust is administered by five Trustees, one of whom is designated the Managing Trustee, and the Managing Director. The purpose of the Trust is to collect, hold and verify royalties paid into the Trust by the operating companies, German subsidiaries of the Exxon Mobil Corporation and the Royal Dutch/Shell Group of Companies. The royalties are paid out in whole cents on a quarterly basis to the Trust’s unit owners after making allowances for anticipated administrative expenses. The royalties are derived from the sale of natural gas, sulfur and oil extracted by the operating companies from the Trust’s overriding royalty areas in northwestern Germany as specified in the terms of the two royalty agreements in place. Additionally the Trustees and Managing Director are responsible for complying with all the legal and financial requirements imposed upon a publicly traded business. Further information regarding the Trust is available in the annual and quarterly reports and the filings with the Securities and Exchange Commission that can be accessed in the Investor's section of this website. The Trust has not issued and does not issue any debt or equity securities other than units of beneficial interest and, pursuant to the Trust Agreement which created the Trust, the Trust is not permitted to do so. BEB, a joint venture between ExxonMobil Corp. and the Royal Dutch/Shell, is an integrated gas supply company which is active in exploration, production, import, underground storage and sales of natural gas. As the largest German natural gas producer, BEB provides their customers access to a secure gas supply through a well-balanced structure ensuring gas availability. More than half the natural gas which BEB has at its disposal to cover the demand of its customers comes from its own domestic resources. About 50% of the German gas reserves contain hydrogen sulfide with varying concentrations which must be removed before it can be put to commercial use as a clean environment-friendly energy. BEB therefore operates a gas desulfurization plant at Grossenkneten located south of the city of Oldenburg. At the plant the hydrogen sulfide is removed from the natural gas and then converted to elemental sulfur. The natural gas will be produced from wells located at so called well sites. The visible part of a gas well is the so called christmas tree which forms the wellhead and allows a safe gas production. 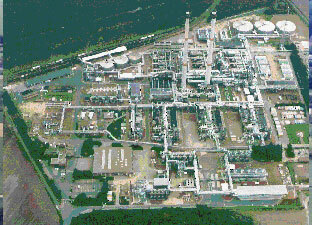 Sulfur solvents are pumped into the sour gas wells preventing elemental sulfur from clogging in the production string. Solvents and reservoir water are co-produced with the gas and removed in the gas dehydration units installed at each production well. The liquids discharged from the gas are collected in tanks. From the dehydration unit, the gas flows through metering devices to permit the field measurement of the raw gas volumes. 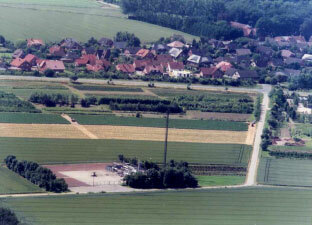 The gas is then transported by way of flow lines to gathering stations and finally to the Grossenkneten plant where the sulfur present in the natural gas is removed. The natural gas is produced from wells located at the so called well site where the gas flows out of the production well. Reservoir water which is co-produced with the gas is separated at the well site. The gas is then fed into BEBs pipeline network.